After nine days in Puebla, my little group of scholarly scholars headed through the Sierra Madres to Oaxaca. Where we ate crickets, again. 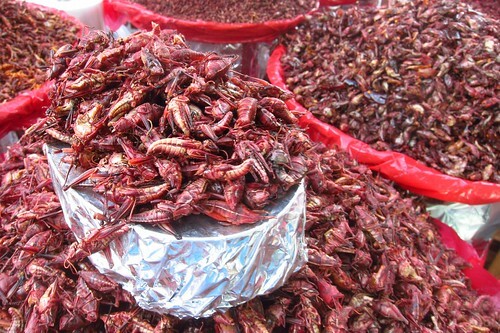 It's like popcorn in that it tastes more like what it's been roasted in than, well, crickets. Just be careful of getting a live one. This half of the trip was significantly skewed to looking at agriculture in an arid location with worsening desertification. One place trying to educate locals on sustainable methods is Tierra del Sol, a permaculture farm outside of Oaxaca. 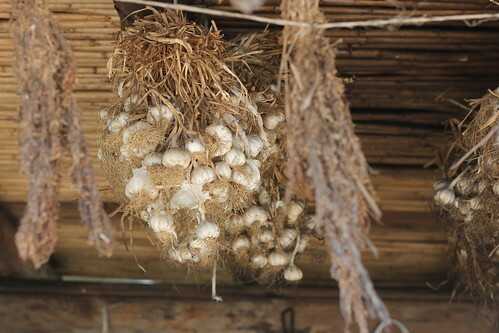 The entire farm strives to be no-impact--we're talking composting everything, including toilets--and grows its own food. From Tierra del Sol we traveled to visit Mitla, stopping for lunch somewhere. By this point in the trip, each and every one of us was craving vegetables, any kind of vegetable. And preferably without any queso. The town's market could only satiate the vegetable craving with these pizzas. 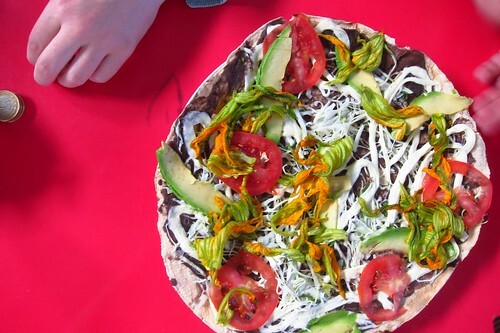 The base is cracker-thin tortilla, a layer of beans, and Oaxaca cheese topped with squash blossoms, avocados, and tomatoes. But it was outside I found *the* *best* *thing* EVER! 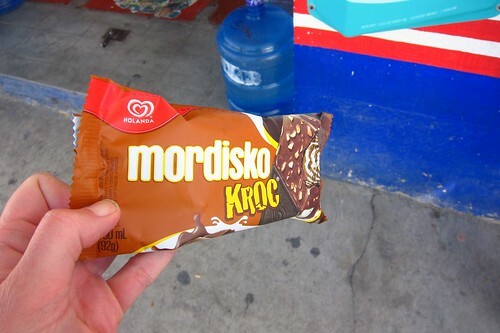 Mordisko Kroc. 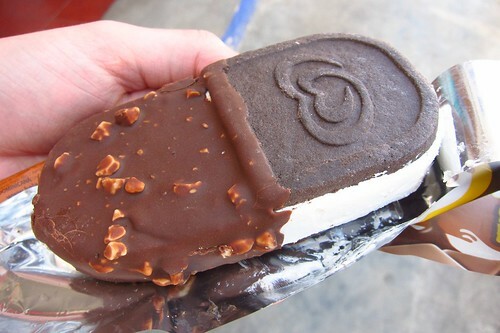 Yes, it's half a crunchy chocolate-covered ice cream bar, half ice cream sandwich. And 100% the best industrial ice cream treat I've ever had in my life. I completely did a "eat one half, then the other" move (ice cream bar first), then spent the next few days looking for another. Then I would have been able to tell you what eating both sides *AT ONCE* would be like. 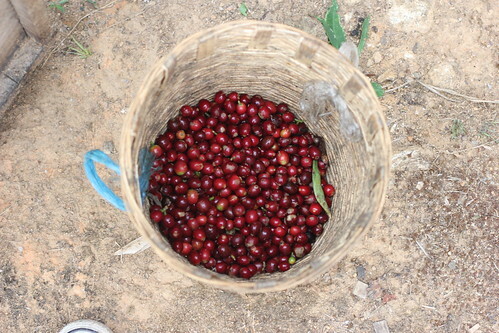 Another aspect of the Mexican market we looked into was the organic coffee industry via CEPCO, a grassroots coffee cooperative. The day even involved hiking through a two acre coffee farm on the side of a mountain. Supporting their sustainable coffee industry gives their farmers a way to support themselves, their families, and their communities, without migrating to America. But they still have to deal with Mexican corporations infiltrating their diet with processed junk food. 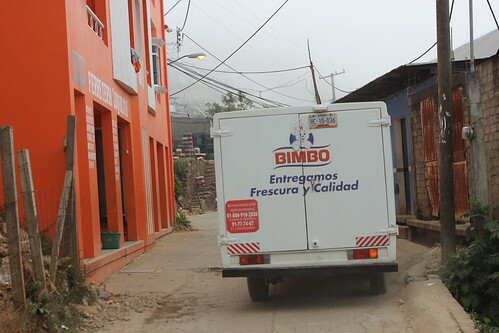 On our way out of the village, we caught the Bimbo truck making its deliveries. 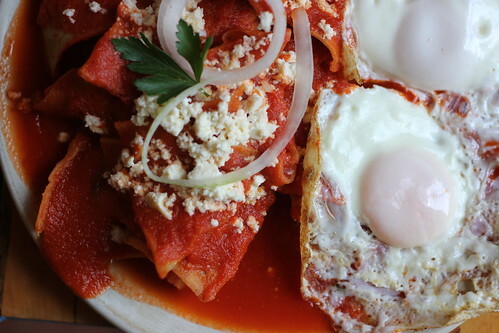 All of this travelling out of town meant barely anytime to explore the food scene in Oaxaca. Though we did find one place to stop by: Lobo Azul Cafe. It showcases local artists, organic coffee, and an Americanized menu including burritos. I still got chilaquiles, but when you're homesick in a foreign country, it's nice to know where to pick up some comfort food. Which I may need when I find myself wandering through Oaxaca again--something I'm already looking into. Ooooh, that's a Maxibon, well loved throughout Europe with slightly differing companies. Ha! Almost every Mexican-brand junk food was a complete rip-off of an American or European one, and often sub-par (I tried the Mexican Twinkies and do not recommend). I'll have to keep my eyes out for Maxibon next time I'm abroad.